One of Stephen's most popular design work was for our annual Halloween costume party 'Disturbia'. I had the opportunity to visit Ireland earlier this month and visit my good friend Stephen who I've known since my college days down in Florida. The two of us along with a few of my other closest friends worked together to build a successful event planning and party promotion business called Thank Me Later LLC. We all wore many different hats during the day to day operation of the company but my main role with TML was curating our social media presence, everything from designing and running our Facebook page to creating our event pages and promoting our parties on and offline. Stephen on the other hand was our resident graphic designer, he was the creative force behind the designs for our business cards, merchandise, and perhaps most importantly our promotional material. Based on the nature of our roles within TML, Stephen and I developed a close relationship and worked together to craft and control the image of our company. Through the years we've broken bread together, thrown countless parties, and have drank more alcohol than I'm willing to admit or accept. Although TML is ultimately what brought us together I have a good feeling we'd still be friends without it. Even after graduation and leaving Florida we've remained in touch, just last year Stephen and I had the opportunity to link up with our friend Pierre in Milan and travel through Italy together. Stephen is originally from the Cayman Islands but pursued a job opportunity in Dublin last year, after settling down he extended an invitation to all of us to come check him out so it was a no brainer for me when it came down to deciding where I wanted to take a vacation this year. After ironing out the dates with Stephen I booked my flight towards the end of October and flew out on a direct flight from JFK to Dublin on Halloween. Honestly, I didn't take as many pictures as I would have liked as a result of only having my 50mm lens on me (procrastination shall forever be my downfall) which made it fairly difficult to capture Dublin's narrow streets but I was able to get some great landscape shots especially on Ireland's beautiful coastline. While the majority of my shots were taken with my Nikon D3300 there are a few images that I took with my iPhone 6s scattered in as well and are denoted with an (i) in the caption. I've included metadata for each image for all of the photography buffs out there, almost all of the images I took during my trip were shot in Aperture priority mode; partly (mainly) because I'm lazy and didn't want to have to worry about constantly adjusting settings between shots but also to have better control of my depth of field especially when shooting Ireland's beautiful landscapes. If you'd like to enlarge an image click (or tap) on it for a better view. I've included a few maps here and there to allow you to get a sense of where I was when I took the picture and some links to give you some background information if you'd like to learn more. Enjoy! Anyone who knows me well knows how much I love Guinness, so one of my favorite parts of visiting Dublin was the opportunity to visit its birthplace at St. James's Gate Brewery. The brewery was founded in 1759 in Dublin by Arthur Guinness. The city leased the property to him at a rate of IR£45 (Irish pounds) per year for 9,000 years (#truestory) and has been the home of the famous stout ever since. 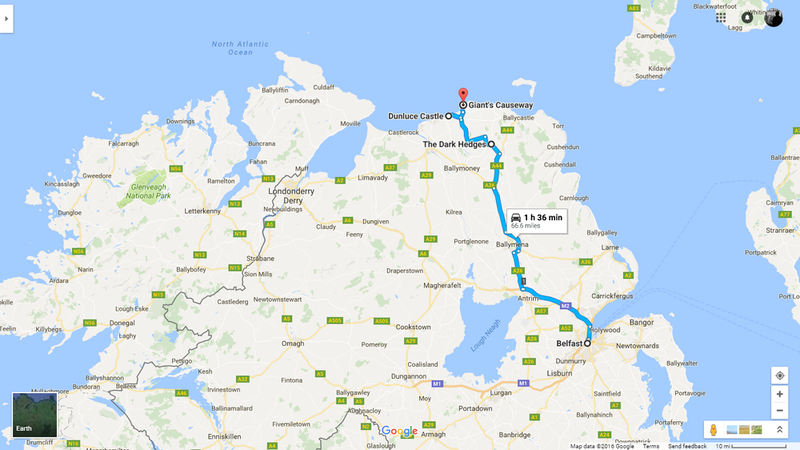 The drive from Dublin to Giant's Causeway normally takes about 3 hours with no stops and light traffic, my bus tour with Finn McCools Tours however took about 5 hours as a result of a few stops along the way. There is an open border between the two nations but only Northern Ireland acknowledges the transition with a "Welcome to Northern Ireland" sign along the highway, driving south back into Ireland you will find no "Welcome to Ireland" sign as the Republic is of the mindset that you never left Ireland in the first place. The first stop along the tour was Northern Ireland's capital and largest city Belfast. Belfast played a key role in the Industrial Revolution and was once the center of the Ireland's linen, tobacco processing, rope-making and shipbuilding industries. In the early 20th century, Harland and Wolff, the company which built the RMS Titanic, was based in Belfast and held the title of the world's biggest and most productive shipyard. The Dark Hedges as seen on Season 2 Episode 1 of The Game of Thrones. Arya Stark has escaped from King’s Landing, disguised as a boy. She is with Yoren, Gendry, Hot Pie and others who are to join the Night’s Watch, in a cart, travelling north on the King’s Road. Finn McCool dukes it out with the Scottish giant Benandonner. Giant's Causeway panoramic (i) The people in the bottom right corner of the image moved as I was panning my phone which is why they look a bit distorted. This fun fact is brought to you by Stewie. On the topic of rainbows, I'm sure you’ve heard the expression “the luck of the Irish” and probably thought it meant people from Ireland had extreme good fortune but the phrase originally has a different connotation. According to Edward T. O’Donnell, an Associate Professor of History at Holy Cross College the term is not Irish in origin. "During the gold and silver rush years in the second half of the 19th century, a number of the most famous and successful miners were of Irish and Irish American birth. Over time this association of the Irish with mining fortunes led to the expression 'luck of the Irish.' Of course, it carried with it a certain tone of derision, as if to say, only by sheer luck, as opposed to brains, could these fools succeed." My second excursion out of Dublin took me westward to an area of Ireland known as The Burren (Irish: Boireann, meaning "great rock"), located on the island's western coast with the Atlantic Ocean. The Burren is known for its karst landscape of bedrock incorporating a vast cracked pavement of glacial era limestone, with cliffs and caves, fossils, rock formations and archaeological sites. On the Atlantic coast, the precipitous Cliffs of Moher are home to thousands of seabirds and are second to only the Guinness Storehouse as Ireland's most visited tourist sites. After two or three nights of heavy drinking, at times almost against my will (these are the friends I have chosen for myself after all) I almost thought about not going out to see the cliffs but Stephen's girlfriend Lynn offered a much needed voice of reason, so Stephen and I decided to book a rental car on Friday night. The three of us packed into the car the following morning and started our drive west from Dublin to the cliffs which took about 3 hours and took us across the heart of Ireland. Visitors of the cliffs proceed at their own caution as there is no fence or guardrail between you and an untimely death hundreds of feet below. You walk past several signs that read "Please do no not go beyond this point" and small placards with suicide prevention hotlines as you walk up the winding path that runs along the cliffs. Unfortunately the lure and height of the cliffs have made them a popular destination for the mentally distressed or depressed looking to end their lives. Sometimes terrible beauty leads to terrible tragedy. O'Brien's Tower marks the highest point of the Cliffs of Moher. The tower was built on the cliffs in 1835 by local landlord Sir Cornellius O'Brien as an observation tower for the Victorian tourists that frequented the cliffs at the time: "strangers visiting the Magnificent Scenery of this neighbourhood". Another version of story tells of O'Brien building the tower in order to impress women he was courting, perched on top of the tower views extend for miles in every direction ... chivalry is not dead. One of my images of O'Brien's Tower was featured on a popular Irish travel photography page on Instagram, with over 1,250 likes at the time of this post (#humblebrag ...Check it out here). Thanks for spending some time and going through my pictures! I'm thinking about doing a few prints and making them available in the Shop section of my website so I'd love to hear which images you liked the most in the comments section below. If you have any questions about the trip, whether its recommendations or you want to learn more about places I visited, comment below as well and I'll reply as soon as I can. Slán go fóill (Goodbye for now).